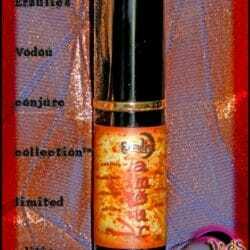 Perfume Oils, Spiritual Perfume Oils & Gemstone Perfume Oils ~ Goddess of Transition & Justice Perfume Oils! As the wife of Baron Samedi, ManMan Bridgette is very powerful as she also rules the Ghede, major life transitions, justice and a fierce protector of children. She is also revered as the great litigator of the pantheon as well, so call upon ManMan Bridgette for justice, court cases, law & litigation! ManMan Bridgette is known to be very wise, fair & fast acting with those seeking her help! 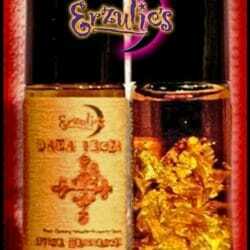 Apply these exquisite perfume oils to draw legal victory, justice, court settlements, protection of children, assistance with all life transitions and save the gemstones for your sacred space when finished. These precious, highly concentrated, smoky and ethereal perfume oils are hand-blended with 100% pure essential oils of Frankincense, Superior Ylang-Ylang, Ginger & Sandalwood Absolute Oils then bottled with Precious Amethyst gemstones to enhance her magical vibration. 15ml Colored Roll On Bottles.